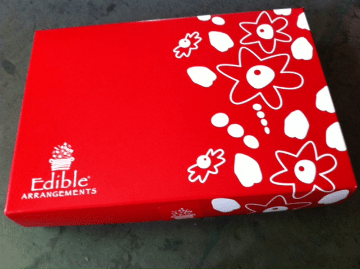 I received a offer to sample Edible Arrangement‘s Tropical Sunrise or Tropical Island box of dipped fresh fruit chunks for a product review and one as a giveaway and I knew that my kids would be really excited to try it. They really like fresh fruits and rave about Edible Arrangements. When I am contemplating a hostess gift of some sort, they always offer up Edible Arrangements as the perfect choice. How they even know about Edible Arrangements is beyond me. We’ve never had one delivered to us before, as far as I know. The box arrived today and was beautifully presented. I like the package design a lot!! It’s a flat box, slightly bigger than a shoe box but much thinner. This would make for a nice present! My kids were about to tear the box open, but I insisted I need to take a few photos for the post! I barely held them off! They correctly identified the dipped covering as coconut. I actually thought it was shaved white chocolate. They were right. They are not fans of the coconut, having grown up on the East Coast but it didn’t deter them from devouring the box with just a small adjustment to remove the offending coconut via paper towel. I tried one and I like the combination of white chocolate and coconut! I guess it’s a good testimonial that they finished the box, and this after we had already made an after-camp stop to PinkBerry. 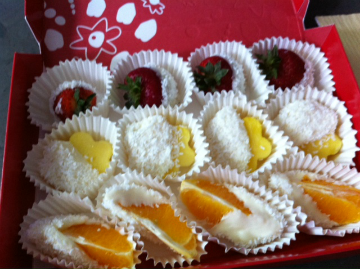 It’s absolutely perfect as a gift or a small indulgence for someone who like coconut and fruit! p.s. Did I mention that my kids are picky? Congrats to Tt! You won the giveaway! Lovely! My kids also love Edible Aarangements- they gave out samples one day at the Newton location (we were at a end of year soccer party next door) – and they have loved them since! You are entered to win! Kids do really love Edible Arrangements. I had no idea! Love Edible Arrangements. Have not tried the Newton location! You are entered to win. Thanks for your comment. I didn’t realize there was a Newton location either! I love these yummy treats. hmm, white chocolate and coconut, seems yummy, I was wondering with its taste. I like the combo of white chocolate and coconut but my kids did not. Awesome giveaway! What a delicious idea for a gift! You won! I just sent you an email.